Ontogenetic, homeostatic, and functional deficiencies within immunoregulatory natural T (iNKT) lymphocytes underlie various inflammatory immune disorders including autoimmunity. Signaling events that control cell fate specification and molecular differentiation of iNKT cells are only partly understood. Here we demonstrate that these processes within iNKT cells require classical NF-κB signaling. Inhibition of NF-κB signaling blocks iNKT cell ontogeny at an immature stage and reveals an apparent, novel precursor in which negative selection occurs. Most importantly, this block occurs due to a lack of survival signals, as Bcl-xL overexpression rescues iNKT cell ontogeny. Maturation of immature iNKT cell precursors induces Bcl-2 expression, which is defective in the absence of NF-κB signaling. Bcl-xL overexpression also rescues this maturation-induced Bcl-2 expression. Thus, antiapoptotic signals relayed by NF-κB critically control cell fate specification and molecular differentiation of iNKT cells and, hence, reveal a novel role for such signals within the immune system. Commitment and differentiation from a pluripotent lymphocyte progenitor to T lineage lymphocytes occur in the thymus gland. T lineage consists predominantly of αβ T cells and a minor population of γδ cells. The αβ T cells include the conventional CD4+8− and CD4−8+ lymphocytes as well as several smaller subsets, such as the natural T (NKT)3 cells and CD4+CD25+ T regulatory cells. Lineage decision, i.e., to become γδ or αβ, takes place early, whereas commitment to CD4+8−, CD4−8+, and NKT lineages, which is specified by interactions with Ag-presenting molecules, occurs late in thymic ontogeny. These cell-fate specifications during thymic ontogeny depend on specific environmental cues, which signal heritable activation and repression of genes. NKT cells comprise a heterogeneous subset, among which the invariant Vα14Jα18 immunoregulatory NKT (iNKT) T lymphocytes predominate. iNKT cells are CD1d-restricted, innate T lymphocytes that express a restricted TCR repertoire, which consists of an invariant Vα14 Jα18 α-chain predominantly paired with a Vb8.2 β-chain (1). iNKT lymphocytes exert critical regulatory effects on adaptive immune responses (2, 3). They develop through the very same early stages as do conventional T lymphocytes (4). Conventional T cell ontogeny progresses from CD4−8− (double negative (DN)) through CD4+8+ (double positive (DP)) to CD4+8− and CD4−8+ (single positive) stages. On the basis of differential CD44 and CD25 expression, four DN stages (DN1–4) are recognized (5). Positive selection of iNKT cells by interaction with CD1d1 appears to take place at the DP thymocyte precursor stage, at which time commitment to this lineage is thought to occur (6). After positive selection, immature iNKT cells proliferate and differentiate into mature cells (6, 7, 8, 9). DX5 and NK1.1 are two NK cell markers whose expression defines intermediates of iNKT cell maturation. Thus, immature DX5−NK1.1− and DX5+NK1.1− and mature DX5+NK1.1+ and DX5−NK1.1+ iNKT cells have been described (7, 8, 9). Negative selection also occurs during iNKT cell ontogeny (10, 11, 12). However, the stages at which positive and negative selection occur and the molecular signals that establish commitment to and regulate differentiation of the iNKT cell lineage remain to be elucidated. NF-κB is an evolutionarily conserved transcription factor critical for regulating innate and adaptive immunity (13). NF-κB consists of hetero- or homodimers of NFκB1 (p50), RelA (p65), cRel, NFκB2 (p52), or RelB subunits. NF-κB subunit composition is cell type specific. In normal T lymphocytes, it consists predominantly of NFκB1-RelA- or cRel-containing heterodimers (14). Successful rearrangement and expression of the TCR β-chain/pre-Tα complex at the DN3 stage signals developmental progression of conventional T cells (β selection). It is of note that high levels of nuclear NF-κB activity mediated by NFκB1 and RelA were detected in DN3 cells that underwent successful rearrangement of the TCR β-chain (15). Inhibition of this NF-κB activity only partially impairs T cell development at the DN3 and DN4 stages (15). Because IL-7 signals are operational and induce Bcl-2 expression at the DN stages, impaired NF-κB signaling has only a modest effect on β selection (15, 16). Thus, inhibition of NF-κB signaling did not impede the acquisition of normal DP cell numbers or alter thymic cellularity and resulted in only a modest reduction in CD4−8+ cell number (17). Furthermore, thymic T cell ontogeny is normal in mice that lack individual NF-κB subunits NFκB1 (18), RelA (19), and cRel (20) or in mice doubly deficient in NFκB1 and cRel (21). However, cell-extrinsic NF-κB signals do influence T cell development (22, 23). Recent reports have shown that RelB signaling, perhaps via a thymic stromal IL-15 secretion mechanism, is essential for iNKT cell development (24, 25). In contrast, NFκB1 plays a cell-intrinsic role in iNKT cell development (24). The few iNKT cells that developed in NF-κB signaling-deficient mice were NK1.1− precursors that showed no signs of apoptosis (24). Hence, the block in iNKT cell development was attributed to a lack of signals for proliferation (24). Thus, although conventional T cell development does not require T cell-intrinsic NF-κB signaling, members of this transcription factor family play important cell-intrinsic and -extrinsic roles in iNKT cell ontogeny. A number of signaling intermediates and transcription factors play critical roles in the development of conventional αβ T cells (26). Most factors required for conventional T cell development, with the exception of Ras/Mek (27), are also critical for iNKT cell development (4, 28). In contrast, the Src-kinase Fyn (29, 30) and the Ets1 transcription factor (31) are critical for iNKT cell ontogeny but are dispensable for conventional T cell development. The mechanism by which these molecules regulate iNKT cell development is not known. The requirement for signaling through the pre-TCR for iNKT cell development is more stringent than for conventional T cells (32, 33). The absolute requirement for pre-Tα, Fyn, and Ets1 suggests that iNKT cell ontogeny requires exquisitely tuned signaling through their invariant TCR. Clearly, signals critical for conventional adaptive T and innate iNKT cell ontogeny are distinct. Furthermore, because NF-κB plays an important role in iNKT cell development, we have dissected the mechanism by which this transcription factor controls iNKT cell ontogeny. We find that NF-κB transmits signals critical for cell fate specification, survival, and molecular differentiation of innate iNKT lymphocytes. C57BL/6 and B6.129-NFκB10/0 mice were purchased from The Jackson Laboratory (Bar Harbor, ME). B6.129-CD1d10/0 (34), B6-ΔNtg, and C-ΔNtg (17) mice have been described. B6.Ja180/0 (35) mice were generous gifts from M. Taniguchi (Chiba University, Chiba, Japan). B6-ΔNtg and C-ΔNtg mice were bred to B6-Eμ36-Bcl-2 mice (36) and C-Lck-Bcl-XLtg mice (37), which constitutively express Bcl-2 and Bcl-xL in T lineage cells, respectively. All mice were bred and maintained in compliance with Vanderbilt University’s Institutional Animal Care and Use Committee regulations. Abs (Table I⇓) for cell surface and intracellular staining were purchased from BD PharMingen (San Diego, CA), unless stated otherwise. Cell-permeable fluorescent substrate inhibitors of caspases 3 (FAM-DEVD-FMK), 8 (FAM-LETD-FMK), and 9 (FAM-LEHD-FMK) were from Serologicals (Norcross, GA). Ab-coated magnetic beads specific for CD4 and CD8 were from Miltenyi Biotec (Auburn, CA). α-Galactosylceramide (αGalCer) was obtained from Kirin Brewery Company (Gunma, Japan). Preparation of tetrameric CD1d1 loaded with αGalCer (CD1 tetramer), its specificity, and use have been described previously (38, 39). Cells were purified using an automated magnetic sorter (Miltenyi Biotec), according to the manufacturer’s instructions. Cell purity was >95% as determined by flow cytometry. Thymocytes of individual, littermate, or age-matched (6- to 10-wk-old) mice were stained for four- or six-color flow cytometric analyses with Abs and reagents as indicated in figure legends. Four-color flow cytometry was performed with a FACSCalibur instrument (BD Biosciences, San Jose, CA), and the data were analyzed with FlowJo software (Treestar, San Carlos, CA). Six-color flow cytometry was performed on an LSRII flow cytometer, and data were collected and compensated using FACSDiva software (BD Biosciences) and were analyzed with FlowJo. Live iNKT cells were enriched by magnetic bead depletion of CD8high cells. Phenotypic analysis of iNKT cells involved a six-color, eight-channel strategy: one channel each on two different lasers were used to gate on CD3ε+ CD1 tetramer+ cells, one “dump” channel was used to enhance specificity, and three channels were to evaluate the phenotype of iNKT cells. This approach enabled direct detection and examination of the few (∼14,000) remaining ΔNtg iNKT cells. For intracellular staining, lymphocytes were first appropriately sorted using magnetic beads. These cells were then fixed and permeabilized with Cytofix/Cytoperm solution (BD PharMingen) according to manufacturer’s protocol and were stained and analyzed by flow cytometry. For details, see legends to corresponding figures. Disruption of single components of NF-κB does not intrinsically impair conventional T cell development (18, 19, 20). However, we found that iNKT cell development is severely impaired in B6.129-NFκB10/0 (NFκB10/0) mice (Fig. 1⇓A). A recent study revealed that NFκB1 functions in an iNKT cell-intrinsic manner (24). Therefore, we took advantage of mice in which IκBαΔN, a dominant-negative inhibitor of NF-κB activity, is expressed in a T lymphocyte-specific manner in C57BL/6 (B6-ΔNtg) and BALB/c (C-ΔNtg) strains for further analysis of the role of NF-κB signaling in T lineage-specific ontogeny. We enumerated thymic, splenic, and hepatic iNKT cells in C57BL/6, B6-ΔNtg, CD1d10/0, and Ja180/0 mice using CD1 tetramer (38, 39). Disruption of T lineage-specific NF-κB signaling resulted in at least 30-fold reduced numbers of iNKT cells in all tissues tested (Fig. 1⇓, B and C). Thus, consistent with the previous report, iNKT cell ontogeny requires NF-κB signaling. NF-κB is essential for iNKT cell development. A, Thymic and splenic iNKT cell complement in C57BL/6 and B6.129-NFκB10/0 mice was analyzed by flow cytometry. Lymphocytes were reacted with CD1d1-αGalCer (CD1 tetramer) tetramer-allophycocyanin, anti-CD8α-FITC (thymus), anti-B220-FITC (spleen), and anti-CD3ε-PerCP-Cy5.5 Abs and were examined by flow cytometry. Stained thymocytes were first gated on live lymphocytes by forward and side scatter (gate 1). Thymocytes of gate 1 were then displayed by a histogram to show CD8α expression, and a second logical gate (gate 2) was set on the CD8αlow population. Similarly, splenocytes and hepatocytes were gated within live lymphocytes and gate 2 criterion was set on B220lowCD8αlow population. Plots shown in this figure are electronically gated to satisfy both gate 1 and gate 2 requirements. Contour plots reveal iNKT cells (CD1 tetramer+ CD3ε+) within electronically gated thymic and splenic lymphocytes. Numbers within plots indicate percent iNKT cells among total lymphocytes. B, Thymic, splenic, and hepatic iNKT cells in C57BL/6, B6-ΔNtg, B6.129-CD1d10/0, and B6-Ja180/0 mice were analyzed by flow cytometry after staining. 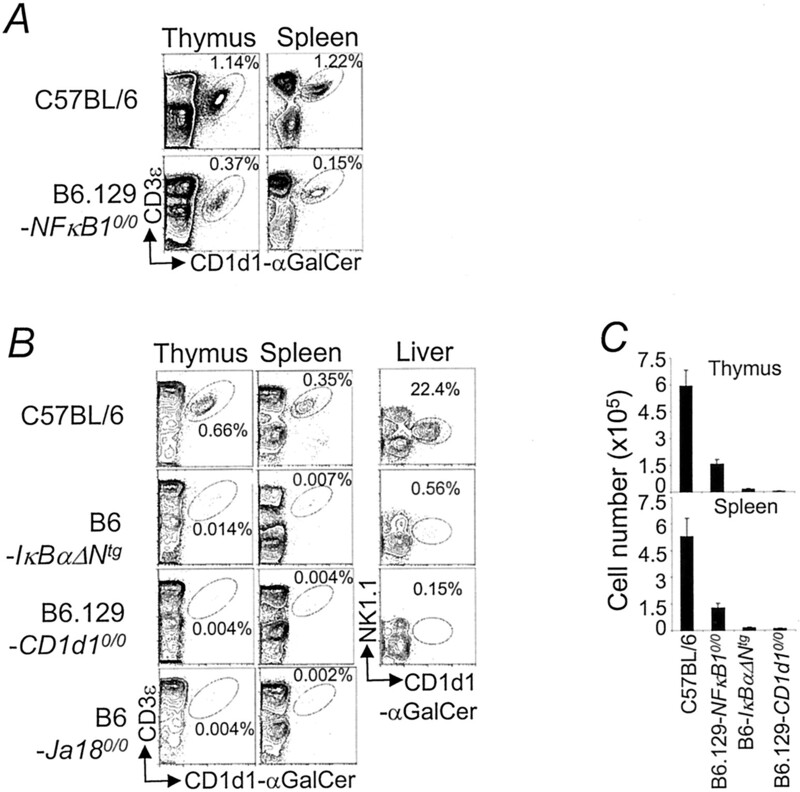 Lymphocytes were reacted with CD1 tetramer, anti-CD8α (thymus), anti-B220 (spleen and liver), anti-CD3ε (thymus and spleen), and anti-NK1.1 (liver) Abs, as described above. Contour plots reveal iNKT cells within electronically gated CD8αlow thymocytes and B220low splenocytes and hepatocytes. Numbers within plots indicate percent iNKT cells among total lymphocytes. C, Absolute numbers were calculated from total cell number and percentages of each population (n = 16, 10, 13, and 8 for C57BL/6, B6.129-NFκB10/0, B6-ΔNtg, and B6.129-CD1d10/0, respectively). Representative of three experiments. To define the developmental block, we characterized the phenotype of the few remaining iNKT cells (∼14,000 cells/thymus) in B6-ΔNtg thymi as described in Materials and Methods. iNKT cells develop from immature DX5−NK1.1− to DX5+NK1.1− to mature DX5+NK1.1+ and DX5−NK1.1+ cells (9). We found that B6-ΔNtg iNKT cells were arrested at the NK1.1− immature stage, with very few cells achieving the NK1.1+ phenotype (Fig. 2⇓A). Development of NFκB10/0 iNKT cells was also arrested at the NK1.1− stage, but a significant number had achieved an NK1.1+ phenotype (Fig. 2⇓A). Expression of CD44 and Ly49C/I is also developmentally regulated in iNKT cells, with low or no expression of these markers in immature cells (7, 9, 40). Maturation of C57BL/6 NK1.1− iNKT cells is accompanied by very high Ly49A/D expression within a subset of NK1.1+ cells, whereas expression of this marker in the remaining cells is very low to none (Fig. 2⇓A). This alteration in Ly49A/D expression appears to be developmentally regulated. iNKT cells express high levels of CD5 (41), a cell surface molecule thought to negatively regulate TCR signaling of conventional T cells interacting with self-ligands (42, 43). Consistent with their immature state, B6-ΔNtg iNKT cells were predominantly NK1.1−CD44low/mediumLy49A/Dlow/mediumLy49C/I−CD5high (Fig. 2⇓A). NF-κB signaling-deficient thymic iNKT cells are arrested at an immature stage and reveal a novel iNKT cell developmental intermediate. A, Phenotype of thymic iNKT cells in C57BL/6, B6-ΔNtg, and B6.129-NFκB10/0 thymi magnetically depleted of CD8high cells was determined by flow cytometry. At least one million events were collected. iNKT cells were identified as CD1 tetramer+ and CD3ε-PerCP-Cy5.5+. Their phenotype was investigated with anti-NK1.1-PE-Cy7, anti-CD44-PE, anti-Ly49C/I-FITC, anti-Ly49A/D-PE, and anti-CD5-FITC. B, Expression of IL-7Rα and IL-2Rβ was determined on C57BL/6, B6.129-NFκB10/0, and B6-ΔNtg thymic iNKT cells by flow cytometry using specific Abs labeled with PE. C, Levels of CD4 and CD24 on thymic NK1.1+ and NK1.1− C57BL/6, B6.129-NFκB10/0, and B6-ΔNtg iNKT cells were determined by flow cytometry, essentially as described above. Intracellular Nur77 levels in NK1.1+ and NK1.1− C57BL/6, B6.129-NFκB10/0, and B6-ΔNtg iNKT cells are shown in contour plots. Thymi were magnetically depleted of CD8 cells reacted with anti-CD3ε-PE-Cy7, anti-NK1.1-PerCP-Cy5.5, and CD1 tetramer, fixed, permeabilized, and reacted with anti-Nur77 or an IgG1-isotype control (clone MOPC-21) and anti-IgG1-PE secondary Ab. Nur77+ gate on the contour plot was set above background staining by the isotype control. In the bottom panel, iNKT cells gated as above (A, bottom panel) were stained with anti-CD24-FITC, anti-DX5-PE, and anti-NK1.1-PerCP-Cy5.5. Histograms depict DX5 levels in electronically gated NK1.1−CD24high iNKT cells. Note that C57BL/6 mice have ∼600,000, whereas B6-ΔNtg mice have ∼14,000 thymic iNKT cells. Among these, NK1.1−CD24highDX5+ population consists of ∼162 and ∼57 thymocytes in C57BL/6 and B6.ΔNtg, respectively. For this reason, it is very difficult to visualize this small population, and the flow cytometry software did not display the 5.9% as a peak (middle right panel). Gates were set as described in Fig. 1⇑A legend. Representative of at least four experiments. iNKT cells developmentally regulate IL-7Rα and IL-2Rβ expression (9, 44, 45). Both immature and mature iNKT cells express high levels of IL-7Rα, whereas only mature iNKT cells express IL-2Rβ (9, 45). Successful positive selection and exit from the DP stage results in re-expression of IL-7Rα during conventional T cell development (46). We found that iNKT cells appear not to require NF-κB to successfully regulate the expression of these cytokine receptors (Fig. 2⇑B). Strikingly, however, B6-ΔNtg thymus contained increased numbers of NK1.1−IL-7Rαlow iNKT cells compared with C57BL/6 (Fig. 2⇑B). The increased numbers of NK1.1−IL-7Rαlow iNKT cells may in part be due to dysregulated expression of IL-7Rα in B6-ΔNtg thymocytes. However, studies on the responsiveness of B6-ΔNtg thymocytes to IL-7 revealed that thymic B6-ΔNtg iNKT cells mount a normal proliferative response to this cytokine as gauged by CFSE dye-dilution within proliferating cells. In fact, the response of B6-ΔNtg iNKT cells to IL-7 was very similar to that observed in C57BL/6 iNKT cells (our unpublished data). Additionally, IL-7 appropriately induced Bcl-2 in C57BL/6, B6-ΔNtg, BALB/c, and C-ΔNtg iNKT cells (our unpublished data). Therefore, a defect in IL-7Rα signaling appears not to account for the observed lack of mature iNKT cells. NK1.1−IL-7Rα− cells might represent a putative precursor of DX5−NK1.1− cells, which undergo positive and/or negative selection. If this were true, the NK1.1−IL-7Rα− cells should be CD24medium/highCD4high and express Nur77, a molecule that allows direct identification of thymocytes undergoing negative selection in an unmanipulated thymus (47). In keeping with our prediction, B6-ΔNtg and NFκB10/0 iNKT cells were predominantly CD4high, and a significant proportion of NK1.1−B6-ΔNtg iNKT cells were CD24high (Figs. 2⇑C and 3⇓). We also found that a substantial proportion of tetramer-positive but NK1.1− B6-ΔNtg and NFκB10/0 iNKT cells were Nur77+ (Fig. 2⇑C), indicating that they are undergoing negative selection. In conventional T cells, negative selection occurs in CD4+8+ thymocytes at or just before the transition from CD24medium/high to CD24low phenotype (47). C57BL/6 NK1.1− immature thymic iNKT cells are predominantly IL-7Rα+ (Fig. 2⇑B), and few if any of these cells are Nur77+ (Fig. 2⇑C). 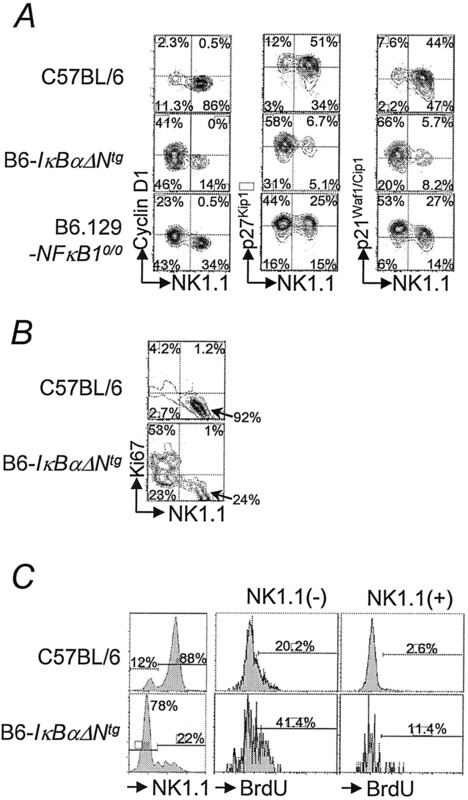 In contrast, about one-half of B6-ΔNtg NK1.1− thymic iNKT cells are IL-7Rαlow (Fig. 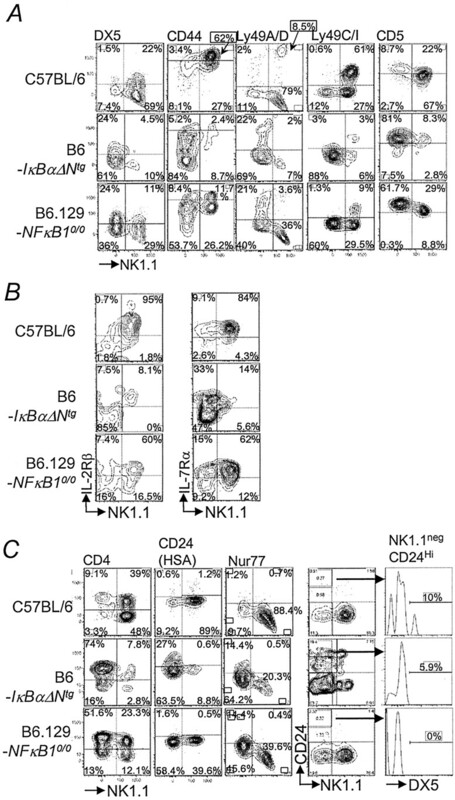 2⇑B) and ∼15% of the NK1.1− cells are Nur77+ (Fig. 2⇑C). Thus, as normal NK1.1− cells found in C57BL/6 mice are Nur77−, the Nur77+ population among NK1.1− B6-ΔNtg iNKT cells is most likely a component of the NK1.1−IL-7Rαlow population. Because of current technical limitations, i.e., measurement of events in 50–150 cells, we were unable to directly confirm that IL-7Rαlow iNKT cells are Nur77+. Taken together, our data suggest that the NK1.1−CD4highIL-7Rα−CD24med/high subset of iNKT cells represents a putative precursor of CD24lowDX5−NK1.1− iNKT cells (Fig. 3⇓), a conclusion corroborated by increased Nur77 expression within NK1.1− iNKT cells (Fig. 2⇑C). At the present time, it is difficult to determine the precursor/product relationship by cell transfer experiments. This is because the putative precursor is defined by tetramer staining of a population that does not express an NKT cell lineage-specific cell surface marker, without which a homogeneous precursor population cannot be purified. A putative ontogenetic pathway for thymic iNKT cells. The gray cell marked with an outline indicates a putative precursor; other intermediates have been described (7 ,8 ,9 ). See Results for details. NF-κB controls proliferation, apoptosis, and survival in activated T lymphocytes. Immature NK1.1− iNKT cells proliferate extensively, whereas mature NK1.1+ iNKT cells exhibit a low level of cell-cycle entry (7, 8). The majority of iNKT recent thymic emigrants are immature, NK1.1− precursors (7, 8). Because the few iNKT cells that develop in NF-κB signaling-deficient mice were annexin V negative (24), we speculated that NF-κB signaling deficiency could block proliferation and, thereby, diminish iNKT cell numbers. Therefore, we scrutinized the proliferative capacity of thymic iNKT cells in B6-ΔNtg and NFκB10/0 mice by three independent methods. First, NF-κB signals control the cell cycle regulators Cyclin D1 and p21Waf1/Cip1 (48, 49, 50), and TCR signaling down-regulates p27Kip1 expression (48, 51, 52), which is essential for conventional T cell development and function. We found that Cyclin D1 expression is developmentally regulated in iNKT cells in an NF-κB-independent manner because higher levels of Cyclin D1 were found in NK1.1− immature, as compared with NK1.1+ mature, iNKT cells (Fig. 4⇓A). Additional data revealed that p27Kip1 levels were high and p21Waf1/Cip1 levels were low, and neither varies significantly during immature-to-mature iNKT cell transition (Fig. 4⇓A). Furthermore, neither p27 nor p21 expression was controlled by NF-κB (Fig. 4⇓A). Consistent with uninterrupted cell-cycle entry and progression, we also found that B6-ΔNtg iNKT cells express Ki67 (Fig. 4⇓B), a nuclear cell proliferation-associated Ag expressed in all stages of the cell cycle except G0 (53). Third, these cells also efficiently incorporated 5-bromo-2′-deoxyuridine (BrdU) in vivo (Fig. 4⇓C). Collectively, these data indicate that the proliferative capacity of iNKT cells remains unaltered in the absence of NF-κB signaling. NF-κB is dispensable for cell cycle entry of developing thymic iNKT cells in vivo. A, Cyclin D1 levels within thymic NK1.1+ and NK1.1− C57BL/6, B6-ΔNtg, and B6.129-NFκB10/0 iNKT cells were determined using a combination of extracellular and intracellular Abs and CD1 tetramer labeling. Cyclin D1 levels were evaluated by intracellular staining with anti-Cyclin D1-FITC and IgG2a-isotype control-FITC. To determine p27 and p21 levels, iNKT-enriched thymi were permeabilized and reacted with anti-p27, anti-p21, or an IgG1-isotype control (clone MOPC-21) and anti-IgG1-PE secondary Ab. B, Contour plots of intracellular Ki67 levels determined by staining with anti-Ki67-PE Ab in thymic NK1.1− and NK1.1+ cells within electronically gated iNKT cells are shown. C, C57BL/6 and B6-ΔNtg mice were injected i.p. with 2 mg of BrdU and were sacrificed 24 h later. BrdU incorporation was determined by flow cytometry after intracellular labeling of thymocytes with anti-BrdU-FITC Ab after extracellular marker staining, fixation, permeabilization, and DNase treatment. Histograms on the left show the expression of NK1.1 on TCRβ+ CD1 tetramer+ iNKT cells. 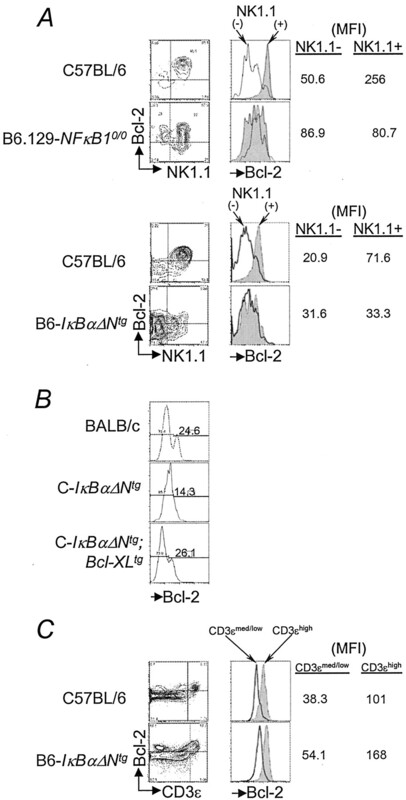 BrdU levels in NK1.1+ and NK1.1− C57BL/6 and B6-ΔNtg iNKT cells are shown in histograms on the right. Histogram gates were set on the basis of background anti-BrdU staining of cells not labeled with BrdU. Gates were set as described in Fig. 1⇑A legend. Results are representative of three experiments. Because our data were inconsistent with altered proliferation as the basis for the ontogenetic block, B6-ΔNtg iNKT cells may be very sensitive to apoptosis. However, a previous study did not find any difference in annexin V binding by wild-type and ΔNtg iNKT cells (24). To investigate whether apoptosis might represent a key mechanism for the block in B6-ΔNtg iNKT cell ontogeny by a sensitive genetic approach, we analyzed the thymi and spleens of B6-ΔNtg;Bcl-2tg and C-ΔNtg;Bcl-xLtg (BALB/c-ΔNtg;Bcl-xLtg) mice. Surprisingly, we found that Bcl-xL, but not Bcl-2, restored iNKT cell ontogeny in the absence of NF-κB signaling (Fig. 5⇓, A and B). To determine whether Bcl-xL transgene expression also rescues differentiation of iNKT cells in the absence of NF-κB signaling, we characterized the phenotype of C-ΔNtg;Bcl-xL iNKT cells. CD44, Ly49C/I, CD69, DX5, IL-7Rα, and IL-2Rβ expression patterns in BALB/c and C-ΔNtg;Bcl-xLtg iNKT cells (Fig. 5⇓C) suggest that they are phenotypically mature. Thus, NF-κB signals survival, but not proliferation, during iNKT cell development. Furthermore, iNKT cells rescued by transgenic expression of Bcl-xL entered the cell cycle at rates similar to those of BALB/c iNKT cells (Fig. 5⇓D). Development of NF-κB-deficient iNKT cells can be restored by Bcl-xL but not Bcl-2 transgenesis. A, Thymic and splenic iNKT cells in the indicated mice were identified as described in Fig. 1⇑B legend. Numbers within plots indicate percent iNKT cells among total lymphocytes. Absolute numbers were calculated as in Fig. 1⇑B. This is shown in the bar graph on the right (n = 16, 13, and 5 for C57BL/6, B6-ΔNtg, and B6-ΔNtg;Bcl-2tg, respectively). B, Thymic and splenic iNKT cell complement of BALB/c, C-ΔNtg, and C-ΔNtg;Bcl-xLtg mice was determined as described in Fig. 1⇑A legend. Numbers within plots indicate percent iNKT cells among total lymphocytes. Absolute numbers were calculated as in Fig. 1⇑B. This is shown in the bar graph on the right (n = 7 each of BALB/c, C-ΔNtg, and C-ΔNtg;Bcl-xLtg mice). C, Phenotypic analysis of thymic iNKT cells rescued by Bcl-xL was performed as described in Fig. 2⇑A legend. Note that BALB/c strain does not express NK1.1 and, hence, only limited phenotyping was possible (65 ). D, S-phase entry of thymic TCRβ+ CD1 tetramer+ iNKT cells in BALB/c, C-ΔNtg, and C-ΔNtg;Bcl-xLtg mice was determined 24 h after injection with 2 mg of BrdU. BrdU incorporation was determined as described in the legend to Fig. 4⇑C. E, Intracellular expression of human Bcl-2 transgene in CD44+CD25−, CD44+CD25+, CD44−CD25+, and CD44−CD25− thymocytes were magnetically depleted of CD4− and CD8+ cells and were CD3–4-8-negative by electronic gating. Bcl-2 transgene expression is also shown in DP, CD8+4−, and CD4+8− lymphocytes and iNKT cells. Black overlays are anti-human Bcl-2 staining of nontransgenic C57BL/6 lymphocytes. Gates were set as described in Fig. 1⇑A legend. Results are representative of three experiments. Bcl-2 and Bcl-xL are generally thought to be functionally equivalent in preventing mitochondrial apoptosis (54). Therefore, the inability of Bcl-2 to rescue iNKT cell development could result from either the lack or alteration of spatio-temporal Bcl-2 transgene expression. Direct examination of intracellular human Bcl-2 transgene expression in DN and DP thymocytes, as well as in iNKT cells of B6-Bcl-2tg mice, revealed its expression from the earliest stages of thymic development, including DN2 through DP and into mature iNKT cells (Fig. 5⇑E). That notwithstanding, iNKT cell ontogeny remains impaired, which is consistent with the inability of Bcl-2 to rescue IL-2Rβ0/0 iNKT cell development (55). To confirm that NF-κB signaling suppresses apoptosis during iNKT cell development in vivo, we used an independent, sensitive biochemical approach to monitor the levels of active caspases directly in iNKT cells. Rescue of C-ΔNtg iNKT cell ontogeny by Bcl-xL transgenesis suggests that NF-κB suppresses the mitochondria-dependent death pathway. Initiatior caspases 8 and 9 are specifically regulated by death domain- or mitochondria-mediated apoptosis, respectively, through the function of effector caspase 3 (56). Very few C57BL/6 iNKT cells expressed cleaved, active caspase 3 (Fig. 6⇓A), which was confirmed directly ex vivo by an independent method using fluorochrome-labeled caspase 3-specific substrate/inhibitor (Fig. 6⇓B). 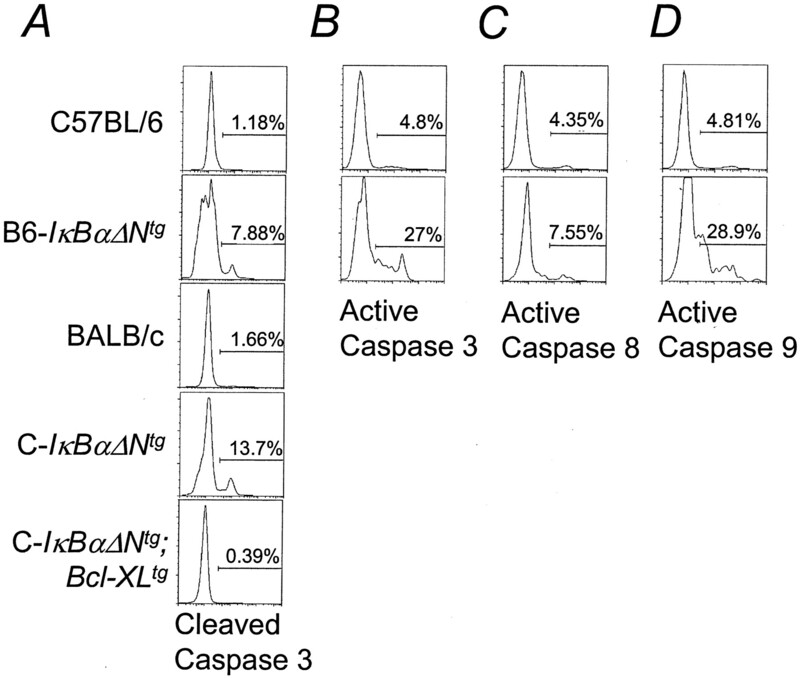 Strikingly, more B6-ΔNtg and C-ΔNtg, but not C-ΔNtg;Bcl-xLtg, iNKT cells contained caspase 3 activity (Fig. 6⇓, A and B). Furthermore, using carboxyfluorescein derivatives of specific inhibitors of activated caspases 8 and 9, we found that active caspase 9 (Fig. 6⇓D) was highly up-regulated in B6-ΔNtg iNKT cells, whereas active caspase 8 (Fig. 6⇓C) was not significantly up-regulated. These data suggest that the mitochondrial caspase 9 death pathway mediates apoptosis in NF-κB signaling-deficient iNKT cells, which is consistent with Bcl-xL’s ability to rescue iNKT cell ontogeny in C-ΔNtg;Bcl-xLtg mice. Thus, NF-κB signaling prevents apoptotic cell death of developing iNKT cells. NF-κB prevents caspase 9-mediated apoptosis during thymic iNKT cell development. A, Levels of active caspase 3 in thymic TCRβ+ CD1 tetramer+ C57BL/6 and B6-ΔNtg iNKT cells were determined by intracellular labeling with activated, cleaved caspase 3-specific Ab. B, Levels of active caspase 3 were determined within electronically gated thymic TCRβ+ CD1 tetramer+ iNKT cells. Thymocytes were magnetically depleted of CD8high cells and were incubated with a cell-permeable fluorescent ligand/inhibitor of caspase 3 (FAM-DEVD-FMK), washed, and reacted with CD1 tetramer and Ab against TCRβ-PE. C, Levels of active caspase 8 in thymocytes were determined using a cell-permeable fluorescent ligand/inhibitor of activated caspase 8 (FAM-LETD-FMK). D, Levels of active caspase 9 in thymocytes were determined using a cell-permeable fluorescent ligand/inhibitor of activated caspase 9 (FAM-LEHD-FMK). Gates were set as described in Fig. 1⇑A legend. Results are representative of four (A) and three experiments (B–D). Significant but low numbers of phenotypically mature NK1.1+ iNKT cells develop in NFκB10/0 mice (Fig. 2⇑A), which provide a unique model to examine the role of NF-κB signaling in iNKT cell differentiation. Conventional T cells in B6-ΔNtg mice up-regulate positive selection-dependent Bcl-2 expression (57, 58) normally (Fig. 7⇓C). The exact developmental stage wherein iNKT cells undergo positive selection has not been determined. In C57BL/6 mice, mature NK1.1+, but not immature NK1.1−, iNKT cells express high levels of Bcl-2 (Fig. 7⇓A). Strikingly, phenotypically mature NFκB10/0 iNKT cells did not up-regulate Bcl-2 after maturation (Fig. 7⇓A). Interestingly, C-ΔNtg;Bcl-xLtg iNKT cells up-regulate Bcl-2 expression (Fig. 7⇓B). Thus, NF-κB specifically signals molecular differentiation of iNKT cells. NF-κB signaling deficiency blocks Bcl-2 regulation during thymic iNKT cell ontogeny. A and B, Intracellular Bcl-2 content was determined in indicated CD8-depleted thymocytes electronically gated within CD3ε+ CD1 tetramer+ iNKT cells as in Fig. 2⇑D. C, Intracellular Bcl-2 content in CD3εlow and CD3εhigh thymocytes of C57BL/6 and B6-ΔNtg mice. Gates were set as described in Fig. 1⇑A legend. Results are representative of at least four experiments. In summary, we demonstrate that the ontogeny of iNKT cells critically depends on NF-κB signaling in a lineage-specific manner. Most importantly, we confirm and extend a recent report (24) and provide a definitive molecular mechanism by which NF-κB signals iNKT cell ontogeny. First, survival rather than proliferation of iNKT cells during thymic ontogeny critically depends on signals transmitted by NF-κB. Second, in the absence of NF-κB signaling, a putative, novel precursor of immature iNKT cells becomes evident. Negative selection of iNKT cells during thymic ontogeny appears to occur at this precursor stage. Finally, the molecular differentiation of iNKT cells is dependent on NF-κB signal transduction. Together, these findings establish a novel role for NF-κB in lymphocyte development and provide a molecular mechanism by which this transcription factor controls iNKT cell ontogeny. Inhibition of NF-κB signaling in B6-ΔNtg and C-ΔNtg mice results in dramatically reduced NK1.1− iNKT cell precursor size and a deficit in their maturation to the NK1.1+ stage. This effect on iNKT cells is lineage specific, because conventional T lymphocyte ontogeny proceeds in a relatively normal manner (15, 17). Because NFκB1 deficiency accounts for only a part of the ΔNtg phenotype, other members of the NF-κB family must also be involved in iNKT cell ontogeny. Our preliminary analyses suggest a role for RelB, but not cRel, in iNKT cell development (A.K.S. and S.J., unpublished observations). However, RelB and its partner NFκB2 were recently shown to play a lymphocyte-extrinsic role in iNKT cell development (24, 25). Therefore, signaling through RelA, which forms a classical NF-κB heterodimer with NFκB1, may have a nonredundant role in iNKT cell ontogeny. Thus, we conclude that the ontogeny of functional iNKT cells requires signal processing by NFκB1. Furthermore, the absolute requirement for NFκB1 signaling in iNKT cells is unique to this lymphocyte lineage because p50 deficiency has essentially no effect on conventional T cell ontogeny (18). We considered several mechanisms by which NF-κB may control iNKT cell ontogeny. First, because Cyclin D1 was previously shown to be an NF-κB-induced cell cycle regulator, NF-κB may signal iNKT cell proliferation (49, 50). This possibility is further supported by the fact that immature iNKT cells proliferate extensively. Therefore, NF-κB signaling deficiency in ΔNtg mice could block proliferation of immature iNKT cells and, hence, could account for impaired iNKT cell ontogeny. However, Cyclin D1 expression in iNKT cells was developmentally regulated in an NF-κB signaling-independent manner. We surmise that NF-κB-dependent Cyclin D1 regulation may be cell type specific and/or may vary between primary cells and cell lines. Thus, the lack of NF-κB signaling does not impair proliferation and, hence, does not account for impaired iNKT cell ontogeny. Second, NF-κB may signal survival and differentiation during iNKT cell ontogeny. However, an independent study revealed that wild-type and NF-κB signaling-deficient iNKT cells show very little difference in annexin V binding, and it concluded that the survival of these lymphocytes was not perturbed (24). The sensitivity of annexin V staining of freshly isolated cells and the signal-to-noise ratio may partly explain the differences between the earlier study (24) and the present one. We found very high background levels in annexin V binding of in vitro activated iNKT cells, making data interpretation difficult. Therefore, we used more sensitive genetic and complementary biochemical approaches to directly monitor apoptotic processes within developing iNKT cells. Our data revealed that Bcl-xL, an NF-κB-induced antiapoptotic protein, rescues both survival and differentiation in ΔNtg iNKT cells. However, it was unable to rescue in vivo iNKT cell function (data not shown). In contrast, Bcl-2 did not even partially rescue the development of ΔNtg iNKT cells, despite its expression from the DN2 stage into DP and mature iNKT cells. The ability of T lymphocytes to sustain a long-term proliferative response upon activation by Ag correlates with cell division-linked Bcl-xL up-regulation, whereas Bcl-2 levels did not vary dramatically (59). Our preliminary data suggest that the ability to sustain long-term proliferative responses of cytokine-stimulated iNKT cells correlates with cell cycle-linked Bcl-xL, but not Bcl-2, expression (A.K.S. and S.J., unpublished observations). These results indicate that Bcl-xL may regulate iNKT cell survival during proliferation of NK1.1-negative immature cells, whereas Bcl-2 regulates survival of noncycling cells. Consistent with this notion, we found that iNKT cells up-regulate Bcl-2 expression upon differentiation into NK1.1+ mature, Ki67− noncycling cells. Two pieces of evidence support a role for negative selection in shaping the iNKT cell repertoire (10, 11, 12). However, the stage at which negative selection occurs in iNKT cells remains unknown. In ΔNtg mice, we found a putative iNKT cell precursor whose phenotype was CD4highCD24highIL-7Rαlow and DX5−NK1.1−. We also found that DX5−NK1.1− iNKT cells expressed Nur77. Negative selection occurs in conventional T cells among CD24high DP thymocytes while transiting into the CD4high single positive stage (47). Therefore, we posit that negative selection within the iNKT cell lineage occurs at the putative CD4highCD24highIL7-Rα−DX5−NK1.1− precursor stage. Activation of iNKT cells under certain circumstances is pathogenic. For example, recent evidence suggests that iNKT cells are important mediators of airway hyperreactivity (60) and the lethal Shwartzman reaction (61, 62). Additionally, cerebral malaria is exacerbated in certain mouse strains, which appears to be controlled by iNKT cell activity (63). We find that NF-κB signaling is preferentially critical for iNKT cell development. This may explain why ΔNtg mice develop Th2-biased immune responses, but fail to induce airway hyperreactivity to allergen inhalation (64). Thus, our findings highlight that short-term therapeutic inhibition of NF-κB signaling has substantial clinical potential. In conclusion, antiapoptotic signals relayed by NF-κB critically control cell fate specification and molecular differentiation of iNKT cells and, hence, reveal a novel role for such signals within the immune system. We thank Kirin Brewery for synthetic αGalCer, M. Taniguchi for B6-Ja180/0 mice, A. J. Joyce for expert technical assistance, M. H. McReynolds for ΔNtg mouse genotyping, and M. Henderson for expert secretarial assistance. ↵1 This work was supported by grants from the National Institutes of Health (Grants HL68744, AI50953, NS44044, HL61752, AI49460, and AI42284), the Juvenile Diabetes Research Foundation, the Human Frontiers in Science Programme, and the Sandler Family Foundation. ↵3 Abbreviations used in this paper: NKT, natural T; iNKT, invariant NKT; DN, double negative; DP, double positive; αGalCer, α-galactosylceramide; BrdU, 5-bromo-2′-deoxyuridine. Bendelac, A., M. Bonneville, J. F. Kearney. 2001. Autoreactivity by design: innate B and T lymphocytes. Nat. Rev. Immunol. 1:177. Joyce, S.. 2001. CD1d and natural T cells: how their properties jump start the immune system. Cell. Mol. Life Sci. 58:442. Bendelac, A., R. Medzhitov. 2002. Adjuvants of immunity: harnessing innate immunity to promote adaptive immunity. J. Exp. Med. 195:F19. Kronenberg, M., L. Gapin. 2002. The unconventional lifestyle of NKT cells. Nat. Rev. Immunol. 2:557. Shortman, K., L. Wu. 1996. Early T lymphocyte progenitors. Annu. Rev. Immunol. 14:29. Gapin, L., J. L. Matsuda, C. D. Surh, M. Kronenberg. 2001. NKT cells derive from double-positive thymocytes that are positively selected by CD1d. Nat. Immunol. 2:971. Benlagha, K., T. Kyin, A. Beavis, L. Teyton, A. Bendelac. 2002. A thymic precursor to the NK T cell lineage. Science 296:553. Pellicci, D. G., K. J. Hammond, A. P. Uldrich, A. G. Baxter, M. J. Smyth, D. I. Godfrey. 2002. A natural killer T (NKT) cell developmental pathway involving a thymus-dependent NK1.1−CD4+ CD1d-dependent precursor stage. J. Exp. Med. 195:835. Gadue, P., P. L. Stein. 2002. NK T cell precursors exhibit differential cytokine regulation and require Itk for efficient maturation. J. Immunol. 169:2397. Bendelac, A., N. Killeen, D. R. Litman, R. H. Schwartz. 1994. A subset of CD4+ thymocytes selected by MHC class I molecules. Science 263:1774. Chun, T., M. J. Page, L. Gapin, J. L. Matsuda, H. Xu, H. Nguyen, H.-S. Kang, A. K. Stanic, S. Joyce, W. A. Koltun, et al 2003. CD1d-expressing dendritic cells but not thymic epithelial cells can mediate negative selection of NKT cells. J. Exp. Med. 197:907. Pellicci, D. G., A. P. Uldrich, K. Kyparissoudis, N. Y. Crowe, A. G. Brooks, K. J. L. Hammond, S. Sidobre, M. Kronenberg, M. J. Smyth, D. I. Godfrey. 2003. Intrathymic NKT cell development is blocked by the presence of α-galactosylceramide. Eur. J. Immunol. 33:1816. Li, Q., I. M. Verma. 2002. NF-κB regulation in the immune system. Nat. Rev. Immunol. 2:725. Voll, R. E., E. Jimi, R. J. Phillips, D. F. Barber, M. Rincon, A. C. Hayday, R. A. Flavell, S. Ghosh. 2000. NF-κB activation by the pre-T cell receptor serves as a selective survival signal in T lymphocyte development. Immunity 13:677. Baird, A. M., R. M. Gerstein, L. J. Berg. 1999. The role of cytokine receptor signaling in lymphocyte development. Curr. Opin. Immunol. 11:157. Boothby, M. R., A. L. Mora, D. C. Scherer, J. A. Brockman, D. W. Ballard. 1997. Perturbation of the T lymphocyte lineage in transgenic mice expressing a constitutive repressor of nuclear factor (NF)-κB. J. Exp. Med. 185:1897. Sha, W. C., H. C. Liou, E. I. Tuomanen, D. Baltimore. 1995. Targeted disruption of the p50 subunit of NF-κB leads to multifocal defects in immune responses. Cell 80:321. Doi, T. S., T. Takahashi, O. Taguchi, T. Azuma, Y. Obata. 1997. NF-κB RelA-deficient lymphocytes: normal development of T cells and B cells, impaired production of IgA and IgG1 and reduced proliferative responses. J. Exp. Med. 185:953. Kontgen, F., R. J. Grumont, A. Strasser, D. Metcalf, R. Li, D. Tarlinton, S. Gerondakis. 1995. Mice lacking the c-rel proto-oncogene exhibit defects in lymphocyte proliferation, humoral immunity, and interleukin-2 expression. Genes Dev. 9:1965. Zheng, Y., M. Vig, J. Lyons, L. Van Parijs, A. A. Beg. 2003. Combined deficiency of p50 and cRel in CD4+ T cells reveals an essential requirement for nuclear factor κB in regulating mature T cell survival and in vivo function. J. Exp. Med. 197:861. Senftleben, U., Z. W. Li, V. Baud, M. Karin. 2001. IKKβ is essential for protecting T cells from TNFα-induced apoptosis. Immunity 14:217. Horwitz, B. H., M. L. Scott, S. R. Cherry, R. T. Bronson, D. Baltimore. 1997. Failure of lymphopoiesis after adoptive transfer of NF-κB-deficient fetal liver cells. Immunity 6:765. Sivakumar, V., K. J. Hammond, N. Howells, K. Pfeffer, F. Weih. 2003. Differential requirement for Rel/nuclear factor κB family members in natural killer T cell development. J. Exp. Med. 197:1613. Elewaut, D., R. B. Shaikh, K. J. Hammond, H. De Winter, A. J. Leishman, S. Sidobre, O. Turovskaya, T. I. Prigozy, L. Ma, T. A. Banks, et al 2003. NIK-dependent RelB activation defines a unique signaling pathway for the development of Vα14i NKT cells. J. Exp. Med. 197:1623. Pillai, S.. 2000. Lymphocyte Development: Cell Selection Events and Signals During Immune Ontogeny Berkhauser, Boston. Alberola-Ila, J., K. A. Hogquist, K. A. Swan, M. J. Bevan, R. M. Perlmutter. 1996. Positive and negative selection invoke distinct signaling pathways. J. Exp. Med. 184:9. Stanic, A. K., J. J. Park, S. Joyce. 2003. Innate self recognition by an invariant, rearranged T-cell receptor and its immune consequences. Immunology 109:171. Gadue, P., N. Morton, P. L. Stein. 1999. The Src family tyrosine kinase Fyn regulates natural killer T cell development. J. Exp. Med. 190:1189. Eberl, G., B. Lowin-Kropf, H. R. MacDonald. 1999. NKT cell development is selectively impaired in Fyn-deficient mice. J. Immunol. 163:4091. Walunas, T. L., B. Wang, C. R. Wang, J. M. Leiden. 2000. The Ets1 transcription factor is required for the development of NK T cells in mice. J. Immunol. 164:2857. Eberl, G., H. J. Fehling, H. von Boehmer, H. R. MacDonald. 1999. Absolute requirement for the pre-T cell receptor α chain during NK1.1+ TCR αβ cell development. Eur. J. Immunol. 29:1966. Fehling, H. J., A. Krotkova, C. Saint-Ruf, H. von Boehmer. 1995. Crucial role of the pre-T-cell receptor α gene in development of αβ but not γδ T cells. Nature 375:795. Mendiratta, S. K., W. D. Martin, S. Hong, A. Boesteanu, S. Joyce, L. Van Kaer. 1997. CD1d1 mutant mice are deficient in natural T cells that promptly produce IL-4. Immunity 6:469. Cui, J., S. Tahiro, T. Kawano, H. Sato, E. Kondo, I. Toura, Y. Kaneko, H. Koseki, M. Kanno, M. Taniguchi. 1997. Requirement for Vα14 NKT cells in IL-12-mediated rejection of tumors. Science 278:1623. Strasser, A., A. W. Harris, S. Cory. 1991. Bcl-2 transgene inhibits T cell death and perturbs thymic self-censorship. Cell 67:889. Chao, D. T., G. P. Linette, L. H. Boise, L. S. White, C. B. Thompson, S. J. Korsmeyer. 1995. Bcl-xL and Bcl-2 repress a common pathway of cell death. J. Exp. Med. 182:821. Matsuki, N., A. K. Stanic, M. E. Embers, L. Van Kaer, L. Morel, S. Joyce. 2003. Genetic dissection of Vα14Jα18 natural T cell number and function in autoimmune-prone mice. J. Immunol. 170:5429. Stanic, A. K., A. D. De Silva, J. J. Park, V. Sriram, S. Ichikawa, Y. Hirabyashi, K. Hayakawa, L. Van Kaer, R. R. Brutkiewicz, S. Joyce. 2003. Defective presentation of the CD1d1-restricted natural Vα14Jα18 NKT lymphocyte antigen caused by β-D-glucosylceramide synthase deficiency. Proc. Natl. Acad. Sci. USA 100:1849. Voyle, R. B., F. Beermann, R. K. Lees, J. Schumann, J. Zimmer, W. Held, H. R. MacDonald. 2003. Ligand-dependent inhibition of CD1d-restricted NKT cell development in mice transgenic for the activating receptor Ly49D. J. Exp. Med. 197:919. Bendelac, A., O. Lantz, M. E. Quimby, J. W. Yewdell, J. R. Bennink, R. R. Brutkiewicz. 1995. CD1 recognition of mouse NK1+ T lymphocytes. Science 268:863. Azzam, H. S., J. B. DeJarnette, K. Huang, R. Emmons, C. S. Park, C. L. Sommers, D. El-Khoury, E. W. Shores, P. E. Love. 2001. Fine tuning of TCR signaling by CD5. J. Immunol. 166:5464. Azzam, H. S., A. Grinberg, K. Lui, H. Shen, E. W. Shores, P. E. Love. 1998. CD5 expression is developmentally regulated by T cell receptor (TCR) signals and TCR avidity. J. Exp. Med. 188:2301. Lantz, O., L. I. Sharara, F. Tilloy, A. Anderson, J. P. DiSanto. 1997. Lineage relationships and differentiation of natural killer (NK) T cells: intrathymic selection and interleukin (IL)-4 production in the absence of NKR-P1 and Ly49 molecules. J. Exp. Med. 185:1395. Matsuda, J. L., L. Gapin, S. Sidobre, W. C. Kieper, J. T. Tan, R. Ceredig, C. D. Surh, M. Kronenberg. 2002. Homeostasis of Vα14i NKT cells. Nat. Immunol. 3:966. Marsden, V. S., A. Strasser. 2003. Control of apoptosis in the immune system: Bcl-2, BH3-only proteins and more. Annu. Rev. Immunol. 21:71. Cho, H. J., S. G. Edmondson, A. D. Miller, M. Sellars, S. T. Alexander, S. Somersan, J. A. Punt. 2003. Identification of the targets of clonal deletion in an unmanipulated thymus. J. Immunol. 170:10. Murga, C., D. F. Barber. 2002. Molecular mechanisms of pre-T cell receptor-induced survival. J. Biol. Chem. 277:39156. Hinz, M., D. Krappmann, A. Eichten, A. Heder, C. Scheidereit, M. Strauss. 1999. NF-κB function in growth control: regulation of cyclin D1 expression and G0/G1-to-S-phase transition. Mol. Cell. Biol. 19:2690. Guttridge, D. C., C. Albanese, J. Y. Reuther, R. G. Pestell, A. S. Baldwin, Jr. 1999. NF-κB controls cell growth and differentiation through transcriptional regulation of cyclin D1. Mol. Cell. Biol. 19:5785. Hoffman, E. S., L. Passoni, T. Crompton, T. M. Leu, D. G. Schatz, A. Koff, M. J. Owen, A. C. Hayday. 1996. Productive T-cell receptor β-chain gene rearrangement: coincident regulation of cell cycle and clonality during development in vivo. Genes Dev. 10:948. Aifantis, I., F. Gounari, L. Scorrano, C. Borowski, H. von Boehmer. 2001. Constitutive pre-TCR signaling promotes differentiation through Ca2+ mobilization and activation of NF-κB and NFAT. Nat. Immunol. 2:403. Gerdes, J., H. Lemke, H. Baisch, H. H. Wacker, U. Schwab, H. Stein. 1984. Cell cycle analysis of a cell proliferation-associated human nuclear antigen defined by the monoclonal antibody Ki-67. J. Immunol. 133:1710. Huang, D. C., S. Cory, A. Strasser. 1997. Bcl-2, Bcl-xL and adenovirus protein E1B19kD are functionally equivalent in their ability to inhibit cell death. Oncogene 14:405. Minagawa, M., H. Watanabe, C. Miyaji, K. Tomiyama, H. Shimura, A. Ito, M. Ito, J. Domen, I. L. Weissman, K. Kawai. 2002. Enforced expression of Bcl-2 restores the number of NK cells, but does not rescue the impaired development of NKT cells or intraepithelial lymphocytes, in IL-2/IL-15 receptor β-chain-deficient mice. J. Immunol. 169:4153. Opferman, J. T., S. J. Korsmeyer. 2003. Apoptosis in the development and maintenance of the immune system. Nat. Immunol. 4:410. Linette, G. P., M. J. Grusby, S. M. Hedrick, T. H. Hansen, L. H. Glimcher, S. J. Korsmeyer. 1994. Bcl-2 is upregulated at the CD4+CD8+ stage during positive selection and promotes thymocyte differentiation at several control points. Immunity 1:197. Groves, T., M. Parsons, N. G. Miyamoto, C. J. Guidos. 1997. TCR engagement of CD4+CD8+ thymocytes in vitro induces early aspects of positive selection, but not apoptosis. J. Immunol. 158:65. Gett, A. V., F. Sallusto, A. Lanzavecchia, J. Geginat. 2003. T cell fitness determined by signal strength. Nat. Immunol. 4:355. Akbari, O., P. Stock, E. Meyer, M. Kronenberg, S. Sidobre, T. Nakayama, M. Taniguchi, M. J. Grusby, R. H. DeKruyff, D. T. Umetsu. 2003. Essential role of NKT cells producing IL-4 and IL-13 in the development of allergen-induced airway hyperreactivity. Nat. Med. 9:582. Ogasawara, K., K. Takeda, W. Hashimoto, M. Satoh, R. Okuyama, N. Yanai, M. Obinata, K. Kumagai, H. Takada, H. Hiraide, S. Seki. 1998. Involvement of NK1+ T cells and their IFN-γ production in the generalized Shwartzman reaction. J. Immunol. 160:3522. Dieli, F., G. Sireci, D. Russo, M. Taniguchi, J. Ivanyi, C. Fernandez, M. Troye-Blomberg, G. De Leo, A. Salerno. 2000. Resistance of natural killer T cell-deficient mice to systemic Shwartzman reaction. J. Exp. Med. 192:1645. Hansen, D. S., M. A. Siomos, L. Buckingham, A. A. Scalzo, L. Schofield. 2003. Regulation of murine cerebral malaria pathogenesis by CD1d-restricted NKT cells and the natural killer complex. Immunity 18:391. Aronica, M. A., A. L. Mora, D. B. Mitchell, P. W. Finn, J. E. Johnson, J. R. Sheller, M. R. Boothby. 1999. Preferential role for NF-κB/Rel signaling in the type 1 but not type 2 T cell-dependent immune response in vivo. J. Immunol. 163:5116. Hammond, K. J., D. G. Pellicci, L. D. Poulton, O. V. Naidenko, A. A. Scalzo, A. G. Baxter, D. I. Godfrey. 2001. CD1d-restricted NKT cells: an interstrain comparison. J. Immunol. 167:1164.